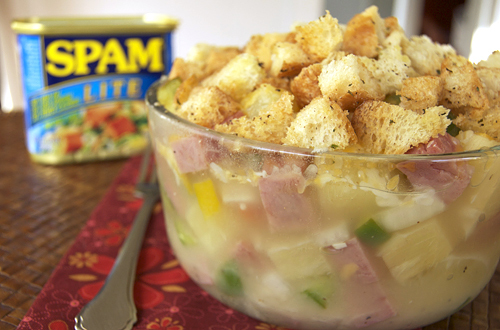 After browsing SPAM recipe ideas, we decided that a pineapple and SPAM combo would be best. SPAM Musubi is another popular Hawaiian recipe, which is grilled SPAM on top of rice wrapped with nori. The salty SPAM (which is canned spiced ham for those of you who had no idea, like me) complimented the sweet pineapple really well. This dish was easy to put together and was actually really good! If you are still freaked out by SPAM, you can substitute *ahem* real ham for the SPAM to make this dish at home, honestly is is much healthier to use real ham so I would recommend it. More Hawaiian recipes to come and a little sneak peak of the Morimoto price fixe Valentine’s Day menu as well, so stay tuned! 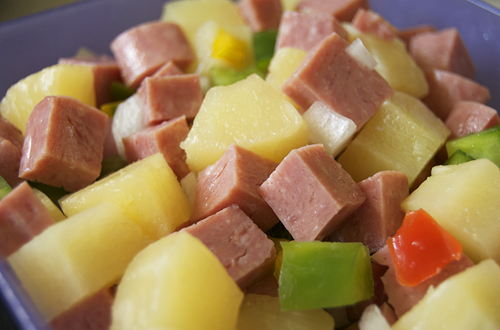 Mix together the pineapple, onion, peppers and SPAM and place in greased 9x13 pan. In a separate bowl, mix together the sugar, flour, pineapple juice. Pour the juice mixture over the SPAM mixture and top with cheese. For the croutons, toss bread cubes with 2 tbsp olive oil, season with parsley, garlic salt and pepper. Toast at 300F until crunchy (about 10 minutes). Increase oven temperature to 375F, cover casserole with foil and bake until soft (about 30 minutes). 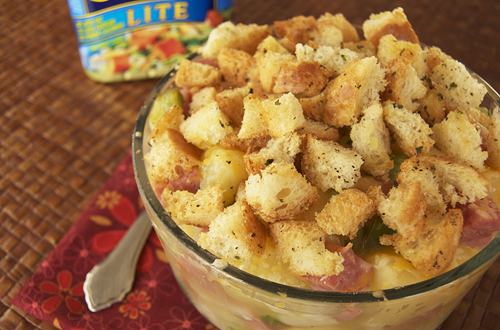 Sprinkle croutons over top before serving. I have a confession: I don’t mind SPAM at all! I even like it! 😀 So I was quite eager to check out your recipe. It sounds delicious! Jennie, Years ago I used to make a Spam and sliced pineapple dinner that was really nice! I sliced the Spam up, and put a slice of pineapple in between each Spam slice, added some of the pineapple juice over the whole thing, and sprinkled some cinnamon and nutmeg and a small amount of brown sugar over top. This all went into a loaf pan, one you’d make a meatloaf in, a nd baked in a 350degree oven for about 40 minutes to an hour. Really a tasty meal. We pan seared red, yellow, and orange mini peppers chopped with some fresh minced garlic. You can add an onion (shallots are nice.) 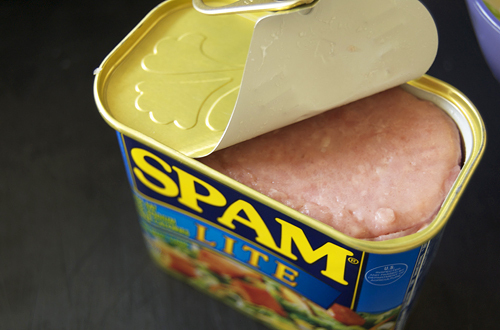 Once they are translucent, cube the spam and add a bottle of homemade, canned tomato sauce with the spam, etc.! Add a can of petite diced tomatoes. We would then add a pasta (whatever was in the the pantry.) Cook until Pasta is al dente. Mix well and enjoy. Leave the pot on the stove, no heat. Believe me, there will be no left-overs if your your house is like mine! Maybe some bread and butter too!